Change Me, Lord! Please? | Redeemed! This weekend, we had our three grandsons over, for a couple of days. What a blessing, they are! Three little live-wire boys, ages one to six years, full of energy and good cheer! 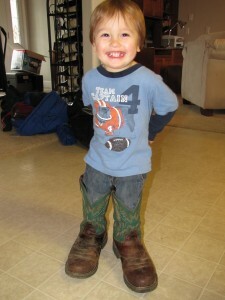 The youngest, at just under two years old, is all smiles and hugs and kisses, despite being at that somewhat awkward stage where he understands most things but has trouble making himself understood; walks and runs great but has trouble keeping up with his brothers; and has a basic understanding of potty-training but has not quite figured out advance warning of a coming mess. I had a simple lunch of hot dogs and fruit started when they arrived. Cleaning up after lunch, I caught the distinctive odor of a dirty diaper. As I started digging diapers and wipes out of the travel bags, the youngest came running up with a grin, “Change me?” he queried, very distinctly. Laughing, I heartily agreed with his analysis, sent him on his way, with a hug and a kiss, then disposed of the offending ew-gross diaper. The whole conversation struck me as hilarious! Although he made the mess, himself, he was anxious to be cleaned up as quickly as possible, and was quite clear in his disdain for the overall grossness of the offending mess. I, too, often make a mess of things, especially when it comes to human interaction and relationships. Despite my years of experience, I find I too often lack the maturity and insight to foresee the coming mess, or foreseeing it, feel helpless to prevent it. Too often, I find myself totally disgusted by a mess of my own making, and the realization that I don’t even have sufficient ability to clean up my own mess. I am so thankful for our Father’s patience with our messes and His willingness to continue to change us! What about you? Can you also relate to my grandson’s desire for cleanliness and disdain for messes of his own making? This entry was posted in Faith, Parenting and tagged cleanliness, faith, grace, living, messes, parenting, perspective, prayer by joe. Bookmark the permalink.